CJ Gets Mean: AKA Film Friday - Super Mario Bros. — GamingWithSwag.com - Dads By Day, Gamers By Night. The 90’s were an interesting time for film. The “indies” were going mainstream, and underground directors like Kevin Smith, Quentin Tarantino, and Richard Linklater were becoming household names with their little films Clerks, Reservoir Dogs, and Slacker. Meanwhile, Hollywood was looking for the next big summer tentpole to capture the zeitgeist for just a few months, enough time to recoup its investment and maybe, just maybe, make enough money to finance the next big gamble. The 90’s gave us the spec boom, wherein certain writers could make a cool million by pitching a story on a napkin. The 90’s gave us timeless, momentous motion pictures like The Shawshank Redemption, but it also gave us the Flintstones movie. Also, Spawn. It was an odd time to be a movie fan, especially if you were in that 12-25 male sweet spot that nearly every summer blockbuster aimed to please (and some even did. Thanks, Speed and Con Air). 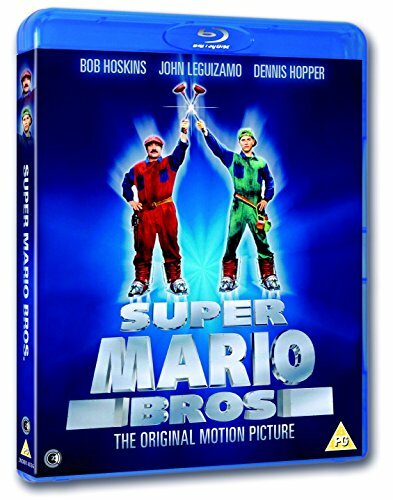 Amidst this odd landscape of film experimentation from weekend filmmakers to star-studded studios, we somehow also got a live-action feature film based on Nintendo’s seminal heroes, The Super Mario Brothers. If you are wondering what all that intro had to do with a Super Mario Brothers adaptation, you already have your answer. The Super Mario Bros. is a quintessential 90’s misstep, a sort of time capsule for an era when Hollywood thought everything needed the “dark, gritty” edge of Tim Burton’s 1989 Batman, at the expense of the charm and innocence of the properties being made, a time when incredible talented actors were reduced to silver screen buffoonery that would haunt them for decades to come, a time that produced Super Mario Bros. I expected to HATE this movie when I started it. I hated it as pre-teen the only other time I watched it, and I was sure I’d keep hating it when I revisited it for this series. Yeah, that’s pretty much how it went. Super Mario Bros. follows two plumbers and a lost princess, as they fall into an alternate dimension where mankind evolved from dinosaurs instead of apes, a world run by the tyrannical Koopa, a dictator who de-evolves subjects into tiny-brained, reptilian Goomba henchmen, to do his evil bidding. While the Mario brothers are in this alternate dimension, they encounter nightclub bouncers, corrupt police, and a mushroom king—yes, a literal fungal king—all while engaging in cartoonish antics on sets apparently shared with other 90’s gems like Demolition Man and Judgment Night (Note, all three films were released in 1993; I may be onto something). Everything about this movie is what’s wrong with films in the 90’s. It’s supposed to be “cool” and “edgy” while also being funny and child-appropriate. in the end, it’s none of these things. In fact, it’s the opposite. It’s pandering, boring, and not really suited for anyone in the audience. The film suffers from an inconsistent tone and overall production quality that screams “BACKLOT STUDIO SET!”. And at 1 hour and 44 minutes, well, it’s far too long. And it’s a shame. The film boasts some great actors in Jon Leguizamo, Bob Hoskins, and Dennis Hopper. The film also had a $40 million budget to use toward production. And it had arguably the biggest character in the history of video games to that point as its focal point. But for whatever reason, these elements did not come together to create something of substance and value. They did not make childhood dreams come alive on the silver screen; they were coerced into a film that becomes of the stuff of nightmares (and rants nearly 25 years after the fact). No. No. No. Also, not even for a bad movie night. Not only did this film fail to entertain me, it literally made me angry. And Sad. If you cannot tell from the above paragraph, I think that under different circumstances, a good Super Mario Bros. film could exist; I want it to exist. Sadly, what is currently on the shelf isn’t it. SHOULD THEY BRING THE KIDS? See above. No one should bother; no one should bring the kids. Frankly, I think even the people involved would be happy if no one else in human history saw the picture. It’s like that. Yeah. Like that. But maybe I’m wrong. In fact, maybe there’s someone out there who loves this movie—it hit them at the right time in life, and they cannot help but love it, even now, twenty-some years later. Are you out there? If so, I empathize with your plight. Trust me. I’m also “that lone fan” on some flics from my childhood. In fact, I’ll talking about one of them next week. Now, let’s hope Chris can provide a kinder opinion. I remember it like it was yesterday. My brother and I had been begging my Dad for weeks to take us to the movie theater in the Christiana Mall so we could see our childhood heroes Mario and Luigi on the big screen. Unfortunately what we got was this monstrosity. I wondered why this looked so much different, so much darker than what I was used to seeing on the Super Mario Bros. Super Show or even the cartoons and the games themselves. The story goes like this, after much infighting between the husband and wife directing team, the production takes a sharp turn for the worse. The movie goes over budget. Scenes that were supposed to take a few weeks turn into months due to arguing and script re-writes. Leguizamo starts to drink to get through production and accidentally injures Hoskins finger in a van door. It just ends up a complete mess. I am surprised Nintendo of America didn't stop it from releasing somehow. Super Mario Bros. is one of those 90s train wrecks that you just can't look away. Well, yes you can. This is that bad. It lost a ton of money at the box office, created a line of crappy action figures and trading cards, along with other merchandise. Nintendo hates to acknowledge it even exists, and when it does it's never in a positive light. It really should have been scrapped and redone as a light-hearted children's Disney romp. Like The Wizard of Oz or Alice in Wonderland. Instead, we get this adult-themed rubbish. Fun Fact: The "Devo Guns" used in the movie are actually modified Super Scope accessories for Super Nintendo. Official Trailer to the 1993 Movie.